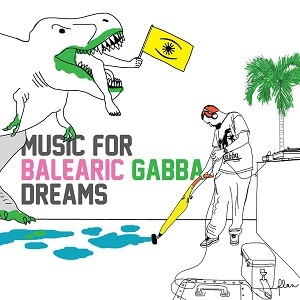 As such The Balearic Gabba Sound System represents the second generation of these so-called Balearic DJs; people who grew up on 90′s raves and survived the digital revolution. Enzo Elia (Hell Yeah house specialist and key member of “El Freakadell”) is one of those enthusiast DJs. His famed and much loved Balearic Gabba Editsdig deeply into the crackling, early90′s Italian house scene and re-edits them for modern purposes, always with a sympathetic touch. There are not too many “spaghetti” episodes along the way, but obscurehands-in-the-air-Riviera moments, tribal retro-winners, wannabe Idjut Boys b-sides and party-sampling manias a go-go do often feature: It’s clear that the collective is about introducing you to a fresh musical sound you’ve been looking hard for, but weren’t even sure existed. Until now.